If you receive this by email, please click on the title of the post to go to the website. The Sears store in Bismarck is closing. I think it’s worth a blog post to offer a tribute to one of the retail wonders of the 20th century. When I was a kid, the Sears and Roebuck catalogue arrived regularly every spring, fall and Christmas. I’d spend hours looking through each section. The Christmas catalog was also known as the “wish book.” You could order almost anything from the Sears catalog, kind of like ordering from Amazon today. Living in a rural area, we depended on mail order to purchase everything from shoes to overalls. Oh, Sears had competition from others, such as Montgomery Wards, affectionately known as “Monkey Wards,” but it ruled. We also had small Sears store in towns where we shopped. I do remember seeing the big Sears store in Bismarck for the first time. I was 12 and the leaders of the Happy Hustlers 4-H Club took two carloads of girls to see the State Capitol in Bismarck. Note: We didn’t have seatbelts, so you could squeeze quite a few little bodies into the backseat. The Sears department store was on Main Avenue and Fourth Street. It had huge plate glass windows, and a brick and black marble front. There were three stories of clothes, furniture and appliances. The ceilings were tin and looked like a wedding cake. Eventually Sears moved north to the new Gateway Mall. After I married and we moved to Bismarck, I made many trips across town to the store. Sears sold Toughskin jeans, which had a lifetime guarantee on the knees. I had two active sons. The knees on the jeans would last two or three weeks, and I’d go and trade them in for a new pair. Later, my first job in Bismarck was at Sears. I dressed up several times a week and drove across town for a 3-hour shift ordering draperies for customers and pricing towels. I was working the day President Reagan was shot. The department was around the corner from the television section, so when I wasn’t busy, I’d watch the unfolding developments. After a few months, I found a job with better hours that was located much closer to home. There was a time when Sears, Penney’s and Montgomery Wards were prominent in the Dakotas. Today, Wards is completely gone and Bismarck has one of the few Penney’s stores in the state. Sears has been struggling for some time. Getting rid of the ever-popular Craftsman tools was a real sign that the store was on shaky ground, and it got so they had so little staff, that you had to hunt for a clerk. The other day, we stopped by the store for a last look. Another couple was walking out as we walked in. The woman nodded. “I’m sorry I came,” she said. It was a little like walking around the estate sale of an old friend. 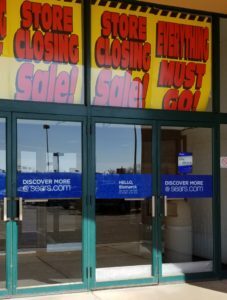 Goodbye Sears, you will be missed. This past month, the plan was to work every day on Amber’s Choice, the sequel to By the Banks of Cottonwood Creek. The reality has been I needed to spend the time pulling together a presentation. While it came together slowly, I’m certainly happy with the end product. Happy, because it’s fun to talk about writing Cottonwood and my historical novel, Secrets of the Dark Closet. But more than that, the presentation is about passing on your family values. Life for younger generations is way different now than it was in the 20th Century. What that really means is people need hope and encouragement more than ever. 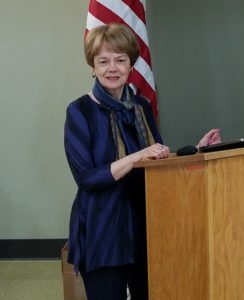 The talk, “Cottonwood Tales,” includes a PowerPoint presentation. I used it for the first time at the Spring Breakfast at the Bismarck Senior Center this past week. For information about scheduling a presentation, please email me at gayleschuck@midco.net. Meanwhile, I’ll be spending more time with Amber McLean. She has some interesting choices to make, and when I left her, she was in a very awkward position. I can’t wait to see how she gets out of this predicament.